Carrefour, the $20B+ multinational retailer, has been using mobile apps since 2012. The purpose of one of these apps was to make the shopper experience easier and more efficient by helping them find new stores and check prices on items with a mobile phone. It may not be the sexiest of apps, but definitely a useful one. 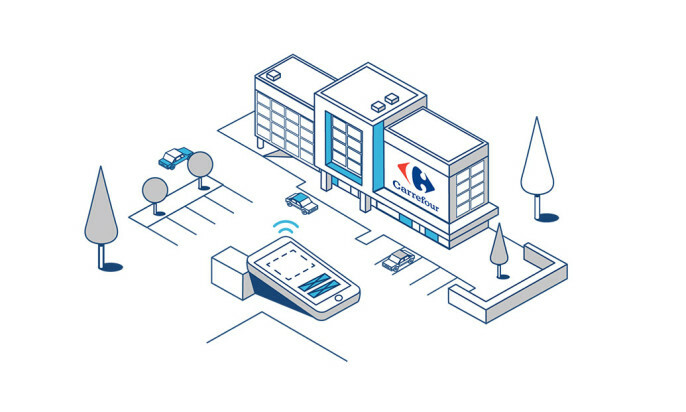 After 2 years, Carrefour added proximity and context to their app with Bluetooth beacons and saw that the exact same application’s engagement went up 400%, virtually overnight! Find more use cases for beacons in retail here. Pixels Trade, a Swiss interactive agency, pitched Carrefour on the potential power of adding context to their existing mobile app, and Carrefour decided to give it a try. Pixels Trade deployed about 50 Kontakt.io beacons in one store in Tunisia and integrated the existing app with Kontakt.io’s API. The goal was to enhance customer experience, boost engagement, and eventually, to increase sales. There were no key indicators or expectations. Either Carrefour and the agency treated it as an experiment. In October 2014 the project launched. What actually happened surprised them both. +50% Conversion Rates With Beacon-Based Marketing! Kontakt.io beacons enriched the app and Carrefour shopping experience with new features, including welcoming a shopper once he or she enters a store, suggesting products based on previous or current purchases, and displaying coupons. There are many reasons why we’ve chosen Kontakt.io. What gives them an advantage over their competitors, is the possibility to replace a battery and get custom beacons at a reasonable price. In terms of security and reliability, Kontakt.io is the best in class. During just 7 months, Carrefour’s rate of app signups practically exploded. The number of app users increased by 600%. Simultaneously, the time spent on using the app increased by 400%! Finally, the proximity data gave Carrefour an invaluable sample of data on where their customers travel throughout the store and in what order, helping improve what the store offers and where to further increase the store’s profitability and opportunity to build customer loyalty. The success and numbers not only went beyond anything the retailer could’ve dreamed up, they showcased the difference between a proximity-enabled application and one without. Devika, thanks for sharing your thoughts! Great work guys! Really good to read about such successful examples of beacon implementations. If there are agencies or retail chains that would like to leverage beacons sign up for Bleesk (http://bleesk.com), a complete beacon marketing platform (cms, mobile app, analytics). Bleesk allows to add beacons, create proximity campaigns and deliver them with ready-to-use Bleesk mobile app that works on iOS and Android or integrate it with custom app. well done. Keep publishing case studies with focus on ROI! Thanks! That’s exactly what we plan to do 🙂 Is there any specific industry that you’re interested in? Check our Air New Zealand – their app is fantastic – people are extremely engaged and I think that they use beacons in the airport. If not, they use your flight number/time to make you think they know you’re there etc. I am sure they’ve seen significant ROI with their App-based maketing efforts.